Slim Jim Series is back, baby. At least not fully yet. The Slim Jim Series though about doing another Rookie Shootout if the class is big. According to the roster, we have 14 (!) rookies: Henry Sandfer, Ryder Smith, Chris Dodd, William Brock, Henry Williams, Dajon Weeks, Tommy Turbo, Raul Sanchez, Marco Rossi, Shane Carter, Ryan Cooper, Greg Marshall, Ashley Brock, and Henrietta Fitzwater. This is the biggest rookie in series history. The race will be 14 laps, and the winner of the Rookie Shootout will advance to the Tabasco Shootout. So far, all of people are saying Sandfer and Smith are contenders for the shootout. That is true. They are both really good, but come on. What about the other rookies that could be studs? 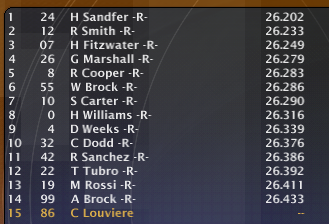 We have pay so much attention to Sandfer and Smith that we are about to forgot the other 12 rookies. Everybody has a shot to win the Rookie Shootout. Yes, even Baby Tribe 5000. Las Vegas is recently repaved to be grip up, but the car still requires mechanical grip at some points. There is a section of Turn 1 and 2 that some driver break suddenly for some reason. There's probably a bump when the track is repaved. Overall, the racing is still like what it was from last season. We could see an exciting Shootout finally. Qualifying for the Rookie Shootout will be posted later. This is the starting grid of the Rookie Shootout. The top favorites for Rookie of the Season sweep the front row with Henry Sandfer getting the pole and Ryder Smith in 2nd. Between Smith's and Brock's times, they are only separated by two tenths. Every rookie has a shot to win the shootout. 14 laps might be quick, but it is a lot of time with 14 cars. Dodd: "It's going to be an exciting race, that's for sure!" Man, hopefully we can get the #4 Pontiac a bit faster for the race, but I will go out and do my best, with Las Vegas being one of my favorite tracks! Smith:" As far as I'm concerned, Sandfer is my biggest challenger.."
The Rookie Shootout is out! Race recap and Tabasco Shootout news will be up either later today or tomorrow. The Tabasco Shootout will be up either Friday or Saturday. Exciting stuff. "Hell ya man. That's what I'm talking about! We stayed patiently until it was time to go. Hopefully we can do the same at the Tabasco Shootout!" CJ Racing wrote: Turbo: 5th, solid race! OOC: I can't believe I did that. At least I know now before we start our first points-paying race. Smith:" Well that #22 Forced a move that took my chances away, glad to know that this rookie class isn't as bad as I thought it was." The wall apparently being made out of Gorilla Glue.